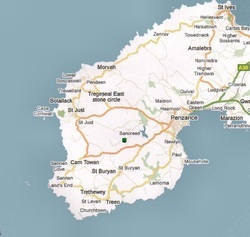 Directions: Follow the A30 around Penzance towards Lands End. Continue through Drift and after about 2 miles taking the turning on your right to Sancreed/Carn Euny. 100 yards on your left is Tregonebris Old Farm.